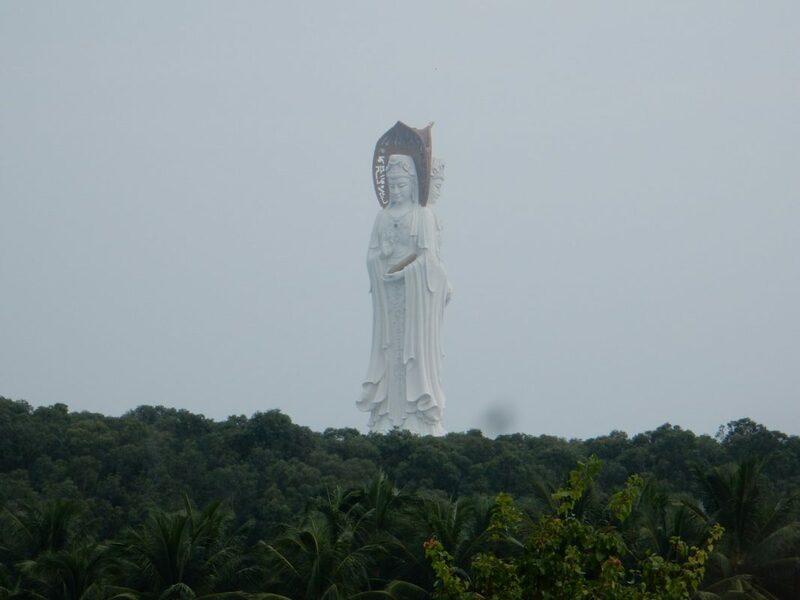 As you fly into Sanya on Hainan Island you see the magnificent 108m tall Buddha rising out of the sea. This was the start of an incredible four day experience – the 3rd World Taiji Cultural Festival. Last year Master Faye Yip had attended with her father Professor Li and subsequently was invited back this year to give a talk plus she was asked to bring a group of students to do a performance at the closing ceremony. An invitation went out to the students and so our journey to Sanya began. Ten of us went in total, five of us were to perform with Professor Li and Master Faye Yip in the closing ceremony; the other five were there to enjoy and soak up the atmosphere. They also provided amazing support to us. Only once we had landed and been taken to the hotel did the scale and enormity of this festival start to hit home. It was such a privilege to be there among all the top Taiji masters. I had no expectation until this moment as my focus had been purely on the performance. What I hadn’t bargained for were the wonderful connections we would make with other people from around the globe. Throughout Faye proudly introduced us to the VIPs of the Taiji world and we were photographed almost constantly. The resort of Nanshan was incredible. In the very humid heat we found ourselves among palm trees, temples and a 108m Goddess of Compassion. The place was so big that there were electric buggies to take you around and although we didn’t see it all we had a really good go at doing as much as possible between attending lectures and rehearsing. We discovered the wonderful Wandeng Temple which faced out onto the bell garden; the Buddha Square which was overseen by Guanyin, the Goddess of Compassion and would be the venue for the opening ceremony. There was a Gold and Jade Buddha housed in a golden temple leading out into the Charity garden with its magnificent stone sculptures. We enjoyed the outdoor swimming pool which was perfect in the hot humid climate. The events we attended didn’t disappoint either. On our first evening we attended a banquet all dressed up in our finery. The lectures although in Chinese were great to attend for a short time just to soak up the atmosphere and of course it was lovely to be able to support Faye and Professor Li when they gave their lectures. There were competitions taking place each day but unfortunately we didn’t manage to see them except for an invitation only competition for elite athletes on the penultimate night. It wouldn’t have been a festival without an opening and closing ceremony. The opening ceremony was held outside complete with red carpet and overseen by Guanyin herself. There were more photographs taken than at a movie premier and we watched some amazing displays on the stage. The closing ceremony had to be brought indoors due to the typhoon that was causing havoc but that didn’t spoil the event in anyway. Our performance was 4th on a list of 36 performances which meant we had the rest of the evening to enjoy the most incredible demonstrations of Taiji. As part of the closing ceremony Professor Li also received a lifetime achievement award. The next day we headed for another resort, Tianya Haijiao, where we did Taiji with the staff before the resort opened. The rest of the day we were looked after like VIPs and enjoyed the hospitality and attractions at this most southern tip of China’s tropical island. That evening we flew to Shanghai and the next day visited Shanghai university where we enjoyed a tour of their martial arts museum before meeting up with Madame Liu for some health qigong in one of the gyms. Professor Zhang also came to see us and gifted us with some moon cakes and a beautiful lunch. The day after Gill and I stayed on in Shanghai while the rest of the group set out on another week’s adventure heading towards Beijing. Gill and I enjoyed a morning in the local park doing Taiji and then an explore of the district in the afternoon before an early night to prepare us for a 5am bus trip to the airport. This was a truly amazing trip. Quite different from the other trips I’ve done with Deyin and has created so many more incredible memories. If you are on Facebook then you can view mini videos of my trip at Angela’s Tai Chi School. Or view some of them on the gallery page. In the gallery on my website are pictures from the trip which hopefully help to bring this narrative alive. And if anyone is interested in a trip to China I highly recommend trying one of the Deyin trips. Details of which can be found on their website.